The second edition of the award-winning Odin’s Ravens has come out by Osprey Games. Every morning Odin sends the ravens Hugin and Munin to race over the world of Midgard and report back what they have seen. The first to return wins Odin’s favor. Fly with these brilliant birds which have some tricks tucked under their wings! 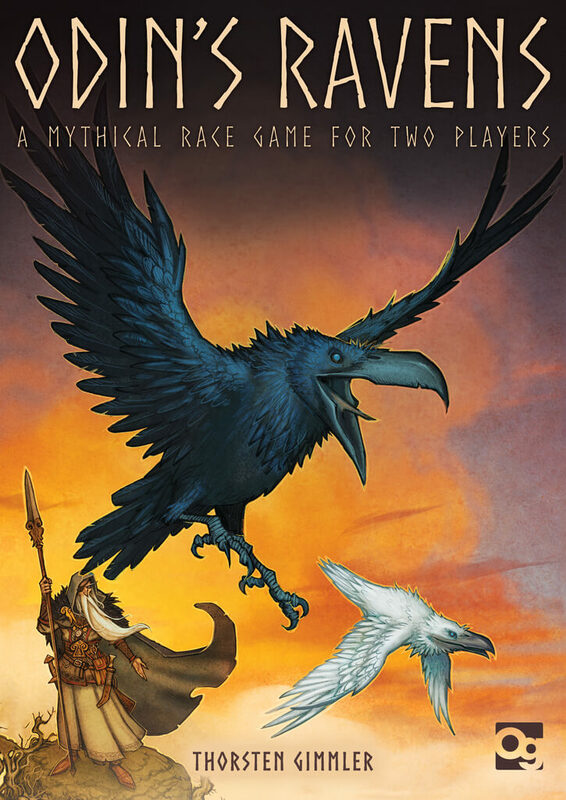 Odin’s Ravens is a two-player racing game, in which you take on the role of the two ravens that have become quite competitive and race across the land every day in order to prove which one is the best. Be the first one to return to Odin and become his favorite raven! Each one of you has a personal deck of terrain cards, from which you draw five cards, you play as many of them as you like and then you end your turn by drawing another three cards. Each card that you play allows you to move forward if the space in front of you matches the terrain you want to play. You may move multiple spaces if there are several spaces of the same terrain in a row. There are, also, the Loki cards which give special powers and help you make your flight easier or your opponent’s flight tougher. Odin’s Ravens (Second Edition) is a revised edition with new rules and an artwork inspired by Norse mythology. It is a fast-paced and tactical game which seems to be quite enjoyable, especially if you love card games!